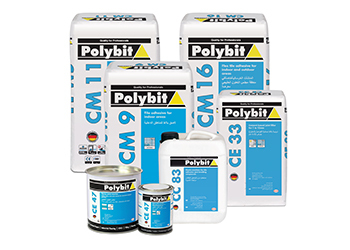 Polybit ... high quality products. The powerful innovations and leading technologies that Henkel offers through Polybit create sustainable value for consumers, professionals and industries, according to Valentina Podocea, brand manager at Henkel Polybit’s UAE office. The outstanding quality of tiling products from the Germany-headquartered Henkel can be attributed to its in-house technologies and tailor-made solutions, she says. “Henkel is the only company from its industry to produce its own polymers for tiling adhesives. Due to the continuous improvement and fine-tuning of these polymers over the years, the company is now able to offer better, faster and safer products,” Podocea points out. “Workability, open time, slip resistance and durability are few of the attributes that craftsmen all over Europe are associating with Henkel tiling solutions. It comes as no surprise that nine out of 10 craftsmen in Europe recommend Henkel tiling solutions, which only reinforces the fact that Henkel products are efficient, strong and reliable,” she adds. Henkel is renowned worldwide for leading innovative brands and technologies in beauty care, laundry and home care and adhesives technologies. “Adhesive technologies form an integral part of Henkel’s portfolio, providing tailor-made solutions in adhesives, sealants and functional coatings for consumers, craftsmen, building applications and industrial sector,” says Podocea. The adhesive technologies unit has a strong, well-balanced portfolio of international, regional and local brands, offering a multitude of applications to satisfy the needs of different target groups and different markets. Focused on catering to the specific needs of the region, Henkel continues to introduce regionally relevant products that are tailored to suit the preferences and requirements of the local consumer and conform to the high standards of German technology. Henkel Polybit Industries is a market leader in the field of waterproofing and construction chemical products in the GCC. Spread across the region with offices in the UAE, Saudi Arabia, Qatar, Oman, Bahrain and Kuwait, Henkel Polybit has a global network of technical experts from the Henkel Group who cater to and fulfil the requirements of the leading engineering consultants, architects and construction authorities in the region. Founded in 1876, Henkel holds globally leading market positions, both in the consumer and industrial businesses, with well-known brands such as Persil, Schwarzkopf, Loctite and Ceresit. This year the company is celebrating its 140th anniversary. What began as a small laundry detergent business in 1876 by Fritz Henkel has transformed into a strong international corporation today. Henkel’s outstanding experience and expertise in the cementitious products has earned it the reputation of being one of the most reliable and efficient brands. With employees from more than 120 nations around the world, Henkel has a strong presence both in mature and emerging markets.